Come join us in the Ani-TAY Café: your stop for discussing all things anime, manga, visual novels, and anything Japan. This week the Café is bustling with talk about guilty pleasures. Come by and talk about everything with us. Header from Date A Live, my official guilty pleasure. We just finished up recording another episode of the podcast. Be sure to keep an eye out for that. The AniTAY Guide to Learning Japanese or Help! I Want to Learn Japanese But I Don't Know Where to Start! Anime DVDs? At the dollar store? Its Free Comic Book Day Today! Let's talk guilty pleasures today. 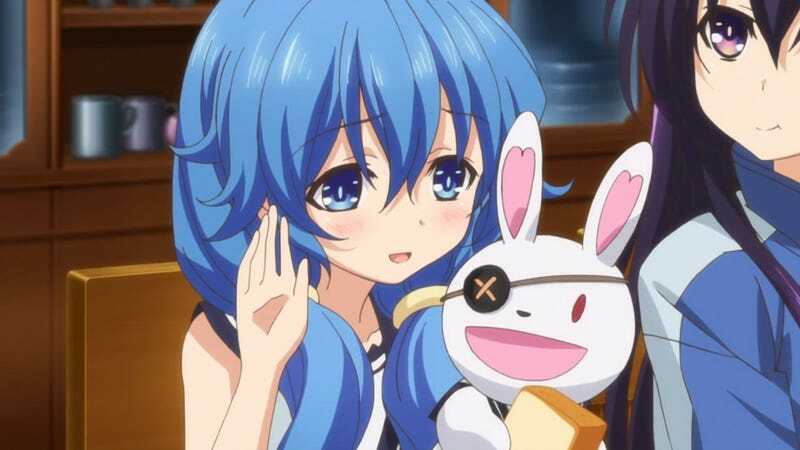 I've made no secret of the fact that I like Date A Live. It's such a gloriously bad show in so many ways. It's packed with fanservice of varying types, nutter plots, and completely insane characters and it has absolutely no shame no matter how much it does these things. It's definitely not going to be a show for everyone, but somehow this (at best) average show became one of the anime that I routinely watch every week. Don't like today's special? Well there's plenty on the menu, so take a walk around the Café and talk with the other customers. Talk about anything. P.S. Yes, this is short today. It's late and I'm tired. Want in on the Ani-TAY action? All you need to do is follow this tutorial and tag your article with Ani-TAY in addition to the other tags you see fit. Also remember that the Café has a selection of image assets for your Ani-TAY writing needs and spreadsheets for coordinating with your fellow Ani-TAY writers. Come join Ani-TAY on MyAnimeList too! We've got forums set up to discuss the ongoing anime this season and you'll get a sneak peak at the Ani-TAY community views on shows of the season long before the reviews come out. Remember to visit TAYnami for even more weekly discussions about our favorite medium: anime. Get in touch with Dexomega or Fruity (vespire50) on Skype so you can get added to the Ani-TAY group. Among other things, the Ani-TAY Podcast may just randomly pull from this group to participate in the After-Hours segments.